Inspired by the British company’s trials sidecar of 1950, the new Watsonian International is the perfect partner for the modern breed of adventure sport bikes. Launched in 1938, with a lightweight all-aluminium body, production of the original International was interrupted by the Second World War and it was not available to the public until 1950, when it was raced in the International Six Days Trial at Llandrindod Wells. The Watsonian management team of Ron Watson and Cliff Bennett also competed regularly on an International outfit in trials events in the early Fifties, as part of a campaign to promote a sportier image for sidecars. Designed primarily for road use, the new version of the International will have a glass fibre body, for ease of maintenance and durability, with aluminium panels to echo the styling of the trials sidecar, and an aluminium mudguard, fitted with indicator and tail light. Beneath the bench seat is a generous-size locker, where luggage can be carried. It is mounted on Watsonian’s proven platform chassis, which is made from tubular steel, with welded joints, and is epoxy powder coated for durability. Hydraulic suspension, with a rising rate spring, ensures a smooth and stable ride. The 16” wheel has powder-coated black steel rim with stainless spokes and is shod with a Bridgestone Trail Wing dual sport tyre. 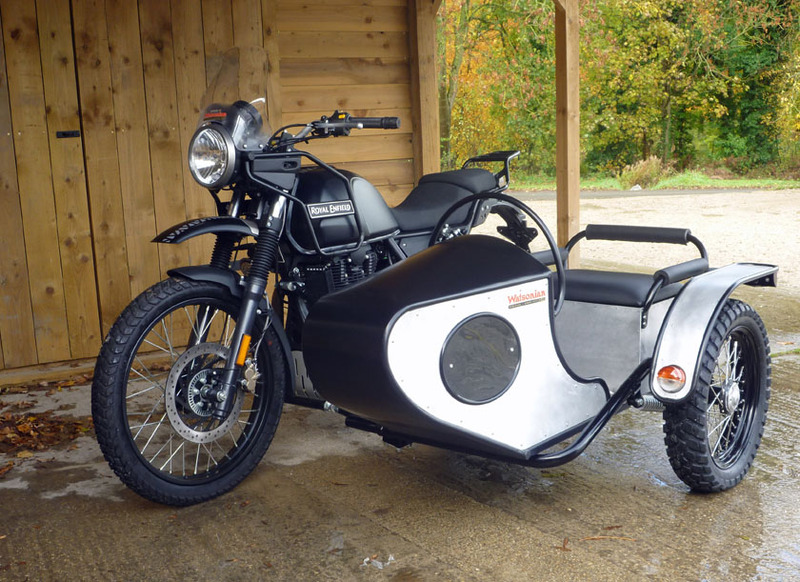 The prototype is shown attached to the Royal Enfield Himalayan, for which Watsonian have developed a new fitting kit, which can be used with any sidecar from their current range. The International will be available for Spring 2019 and will sell for £3,995- (including VAT). The Himalayan fitting costs £450-. See the prototype on the Watsonian stand (2D10) at Motorcycle Live, from 17-25 November.